Ease of use: Freshbooks scores highly here. It has been made to be simple for small businesses to use and is successful on that front with its easy navigation, layout and lots of help getting users started. The design of the site and the software has been done to a pretty good standard making it a pleasure to use. Freshbooks also make it very easy to get started in the software, providing videos and links to what the user must do next. There were a few frustrating points however such as; it being created in Canada meaning it’s generic for all countries rather than being UK specific. Speed: The software doesn’t have much lag and loads quickly, however entering transactions is slow. A professional bookkeeper would not use this software as it would be very time consuming to get through their work. Businesses with volume transactions would also be put off the software for this reason, therefore it is only really suitable for small businesses such as consultants with small amounts of transactions. 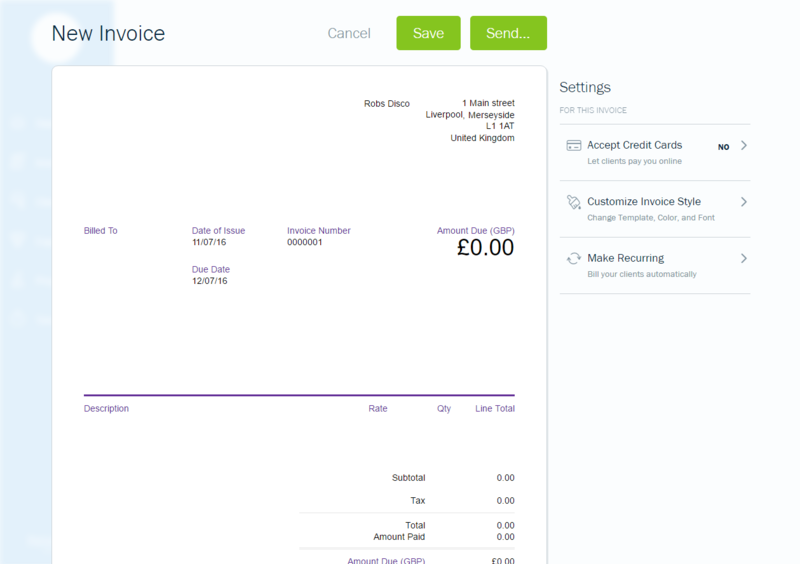 Features: Freshbooks does well on the features front, especially when it comes to invoicing. Features include, links with Stripe etc. for customer receipts, invoice customisation, automatic late fees on overdue invoices, auto late payment reminders, reoccurring invoices and expenses, receipt uploads, bank imports, time and project handling, staff handling and more. Our favourite feature, which seems to be unique to Freshbooks is Snail Mail which will post a hard copy of your invoice to your customers for a small fee. Support: telephone, email and web content (including videos and webinars) are all available and included in the price. However the support is based around the Canadian time zone which may be frustrating for UK users. Reporting: There are 28 reports in total and each one has an explanation of what it is. However the VAT report is very poor and would not suffice for most UK businesses. Price: Most users will require the Evergreen package which is pricey considering it is predominantly invoicing software rather than traditional accounting software. VAT Handling: A weak point for Freshbooks. As the software was not developed for the UK specifically the VAT is not handled very well. Although they do cater for cash accounting which is rare for generic software. The VAT report/return is not good and your accountant would probably have an issue reconciling the VAT control account. 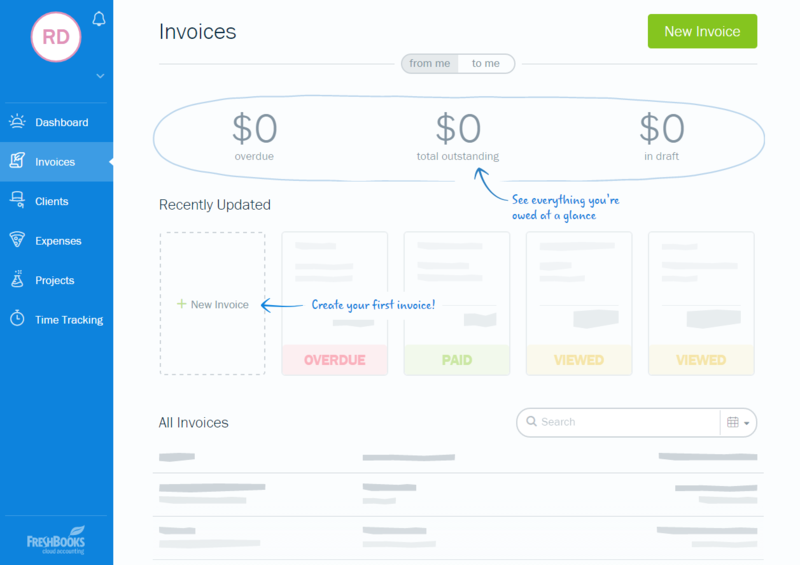 The bits we liked: Setting up the type of invoice you issue to begin with was useful as it means that users do not have to enter quantity and unit price if they are providing a consultancy service for example. Explanations of reports would be very useful for users with little experience as most accounting software just expects all users to know what a balance sheet is. The bits we didn’t like: VAT handling was poor, entering banking transactions and working with nominal accounts was difficult. A novice with little or no bookkeeping experience should be able to use this software, although anyone with more experience would probably want to use something more efficient. Freshbooks can actually integrate with Quickbooks (which is a proper accounting system) so that you can have the best of both worlds, accurate accounting and fancy invoicing. However this would involve maintaining 2 systems which might be more hassle than it’s worth.